Enjoy a natural stay in comfortable tents. The kund remains frozen all round year, which is beauty itself. The trek has true Himalayan beauty. It is at high elevation enclosed from all sides with the mountain range. The trek is guided by experienced leaders. Fresh and delicious food is provided. You will be staying in a geust house at Yuksom. Accommodation on all other days will be in tents (2-3 per tent). 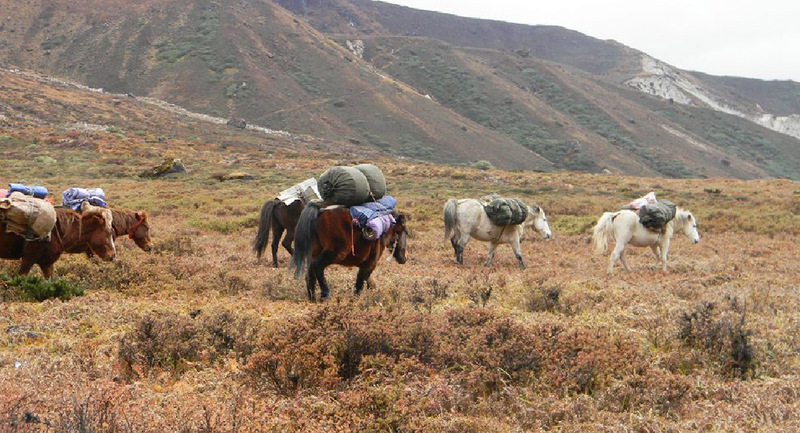 Goecha la trek is based in Sikkim one of the most preferred trek in Sikkim. This trek go through Kanchenjunga national park. This park is inscribed to the INESCO World Heritage Sites list in July 2016 also one of the greenest area in the world. The view of Himalaya from Goecha la is feature in 100 rupee note also. This trek is one of those trek which are in the bucket of every trekker. On the way when you will reach Dzongri you can see a long range Himalaya. You will find 3600 view of eastern Himalaya from here. The peak seen from there are Kanchenjunga, Talung, Koktang, Rathong and many others. On the way you will pass through meadows, beautiful orchards and snow covered path. If you planning in March-May month then it is the best time for those who loves bird watching. The best time to go for Goecha la trek is March-May and September to October (if it’s not raining that time). In the November and December month this trek is considered as a difficult trek due to snow. Goecha la trek is a moderate to difficult trek. 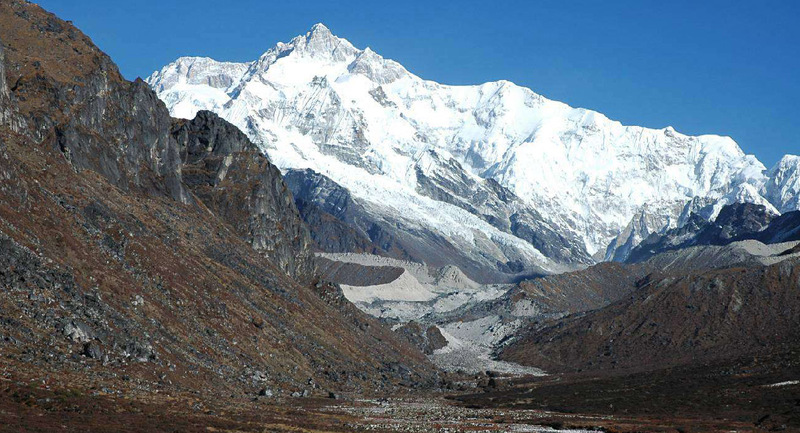 The highest point of this trek is 4,602 m or 15,100 ft. it is a high mountain pass in Sikkim. In the summer this trek is haven for bird lover. And after the monsoons you can see HD views of nature in whole trek. After monsoons this trek upgrades himself from moderate to difficult due to snow but most of trekker also love to go this time. Time Taken: 150 km Drive. First you have to reach Bagdogra airport or new jalpaiguri (NJP) railway station. And the get a drive to Yuksom from NJP which is 148 km drive and from Bagdogra its 150 km. From Yuksom you will move to Sachen. 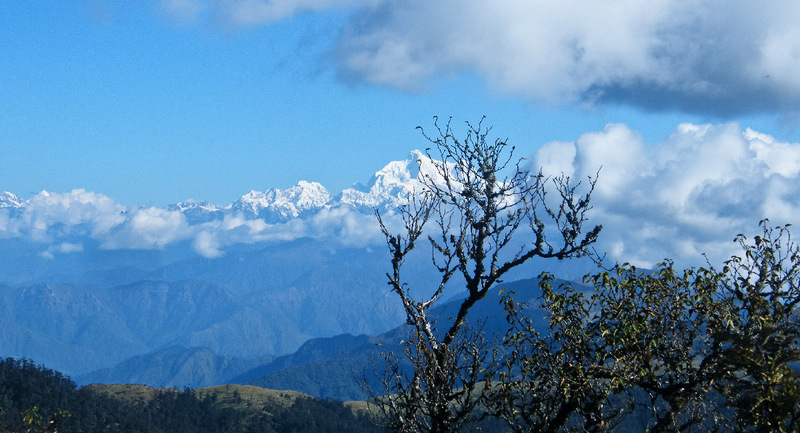 After 2 km of walking you will enter in Kanchenjunga national park. The trek will go through Rathong river bank and two hanging steel bridges. At Sachen you will stay in camps. Today we will trek to Tshoka through beautiful forest which have a variety of trees also hanging bridge surrounded by beautiful nature. After a wonderful trek when you will reach campsite there are amazing view of mountains. Enjoy the view with a sip of hot tea and snacks. Tshoka to Dzongri trek, you will cross a rhododendron forest. The path is like they are leading you. Trees are both side of trek feels like a natural park. After crossing it there are a beautiful view of Prekchu River. In Dzongri night will be colder than last nights. Today we will take a short tour around our camp. Before breakfast we will go to a view point which is 30 min walk. From there we will see a beautiful sunrise in snow covered peaks. After this we will return to campsite for breakfast. After breakfast we will hike to Dzongri-la. At night we will stay at same campsite. Today we will pass a beautiful rhododendron forest again. This forest is best for bird watching. We will walk to downhill in most of the time today. We will pass forest, river bank and beautiful meadows today. 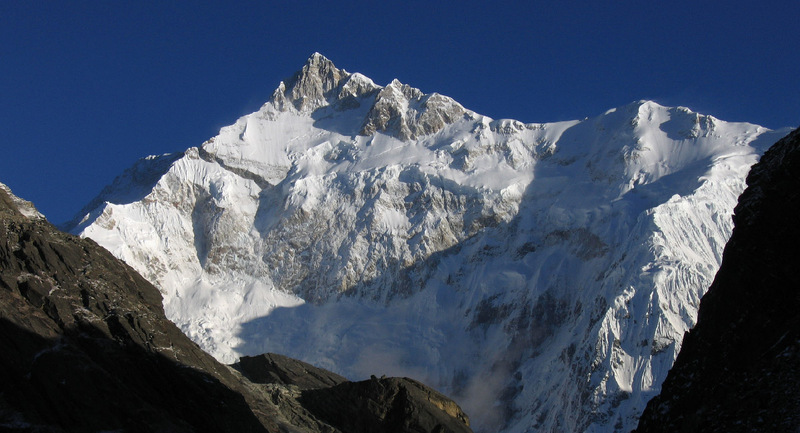 Our camp will be in the lap of mount Pandim. Today we will start early in the morning 3:30 am so we can reach at the destination in the evening and enjoy full time at Goecha la. We will climb to Goecha la early so we can watch sunrise. Trekking will be full of enjoy and adventure today. After enjoying in Goecha la we will go to the campsite thangsing. We will move back to Tshoka from a different route today. The landscape will be different than other day. This is the farewell night full of enjoyment and variety of dinner. A beautiful night with singing and dancing. Today we will trek to downhill from same previous route and get after 6 hour we will reach to hotel. After a long time you can have a hot bath in hotel. Time to say good bye. Final breakfast at Yuksom than proceed to airport or railway station. Trekking on Goechala Trek, no doubt, is one of the most thrilling adventure one could ever have in his/her life. With an elegance of nature and unmatchable experience of the pristine mountain ranges, trekking stands out among all the adventures across the world, but nothing comes free, there are certain aspects of the trekking which one needs to consider while he/she is making up his/her mind for trekking. Here’s a list of some basic requirements which one would need during his/her camp trekking. Let’s pay some heed to these requirements for trekking. A high-quality backpack with an ease of carrying facility with durable and stern straps is one of the important things that you’d need during the entire trekking. The easier it’s to carry, the more fun you can have during your trek. Your regular sports shoes can be a mess during the trek and one of the most regretting things that might take away the joy of trekking. To prevent yourself from slippery patches through the streams, a pair of trekking shoes with good grip would do a great work for you and reciprocate your experience of trekking to the manifolds. Clothing is one of the most important aspects of trekking but that doesn’t imply the “what if situation”, hence carry the clothes that you’d need normally. Carrying more and more clothes will only add the weight, thus the problems. Once on the trek, you’d not generally need to change the clothes every now and then, provided if you maintain your hygiene properly. Three warm layers: On high altitude treks Goechala, temperature after the sunset drops to the considerable degrees. So, during these campsites, you might need an additional layer along with the padded jacket coupled up with a fleece and a warmer. Three trek pants: Please don’t go for jeans/ denim for the substitute for the trek pants since they are not comforting to your stay at the campsites. Wear one pair and carry the remaining two. Three collared Shirts: It’s advised to wear full sleeved shirts instead of the t-shirts in order to prevent ourselves from the sunburn. Carrying a dry-fit t-shirt or two can be a wise idea if you’re trekking during the rainy season. Regardless of the cold weather, trekkers’ bodies tend to sweat and to prevent yourself from falling ill, you’re advised to change your clothes at campsites. Warmers: Warmers or thermals can be used on personal choice depending upon the physical and weather conditions. Sun glasses: Sun Glasses will help to protect you from snow blindness, you should carry one on High altitude trek. Sun cap: The sun feels brighter and nearer at high altitude treks like Goechala. Used sun caps to save your neck and face from sun Burns, Especially if you are trekking at the end of the day. Headlamp/LED burn: Mandatory for each trek. Synthetic hand gloves: Bring one set of Woolen and one Waterproof hand gloves to save your hands from cold. Socks (2 sets): Carry 2 pair of sports socks and a pair of woollen socks as they’d spare you from the dripping temperature at night. Trekking pole: Having a trekking pole in your hand during the trek is your own choice, although at times it may bother you as an unnecessary article but at times it proves out most handy during the submit as it curbs your effort of straight inclinations of the high altitudes which often turns out tiring. An Additional Pack: This is one of the best practices you can do on one-day submits or treks where you need to get back to your campsite by the end of the day. Here you can pack your essentials like a water bottle, medical aids and snacks. This keeps you away from carrying the unnecessary weight. Plastic Bags: To keep everything organized, you should compartmentalize the stuff into plastic zip bags and also carry a few in spare for wet clothes and other by-products. There are certain rules and laws that you need to follow while going for the treks, however, Trekveda takes care of all such kind paper works which are inclusive in the package. Certain registration fees and document verification along with some permissions are required in order to protect the nature and its evergreen heritage for future. In addition to this, if you need to avail a guide, you can also hire a guide with some bucks and a nominal paperwork. Trekking on Goechala is a different kind of adventure where you required to be physically and mentally prepared for the best and worse, at the same time. While high altitudes treks making it tough to breathe, the beauty of those pristine mountains leaves you speechless so that you forget to breathe for a moment or two. In addition to the physical and mental preparation, there is a certain aspect of the health that is needed to be considered on the first hand when you make up your mind about the trekking at Goechala. Trekveda, by efforts of its team, leaves no stone unturned to provide you with the best trekking experience while ensuring your safety as its priority. Here are some vital aspects that Trekveda includes in its checklist to ensure the safety of its trekkers. Trekking at Goechala demands endurance and fitness and those who suffer any kind of physical or physiological ailments are advised not to go for high altitude treks in the beginning. To get assurance about the trekker’s fitness, we comply with certain aspects of the being fit such as BMI (Body Mass Index) along with the fitness proof since we can’t put the trekkers into the risk. Monitoring the health is one thing that is conducted regularly during the Goechala trek by the trek leaders which includes the monitoring of your blood pressure, oxygen level and pulse rate. Details of your health during the trek is maintained in the health card on the regular basis. Health card can be collected from the trek leader at the end of the trek. Trekveda provides you all the necessary equipment for trekking at Goechala from tents to ropes. In addition to that, our trek leaders also ensure the safety by various safeguards they take from time to time for your safety. Microspikes are provided to attach to your shoes which help you to keep the traction on the snow and make it easier to climb. An additional gaiter is provided to cover the snows which prevent the entering of snow into the shoes. Customized tents are provided to the trekkers which ensure the warmth and temperature 10 degrees higher than the outside coupled up with high-quality sleeping bags which can endure the temperature up to 15 degree Celsius below the freezing point. Trekveda, keep all your nutritional and hydration requirements on its checklist, our trek leaders will guide you to keep your body hydrated on the high altitudes Goechala trek as de-hydration can attract to the severe medical emergencies while trekking. In case of any symptoms you feel during the trek, don’t ignore or avoid them, immediately inform the trek leader. In case of medical emergencies, Trek leaders bear the responsibility to get you back to your wellbeing with their training and techniques. Suspecting any physiological disturbance in your body, immediately report to your trek leader as they are trained to face such problems. Problems like Acute Mountain Sickness can prove fatal at Goechala if not taken into consideration seriously on time. If you face any of the symptoms such as a persistent headache, fatigue or weakness, nausea, dizziness, loss of appetite, difficulty in sleeping, you shouldn’t let it go or treat it by your own either just inform your trek leader. Acute mountain sickness is one of the most common yet the fatal problem trekkers face due to a number of reasons, if the problem continues to persist, then you’re advised to come down to the base camp and then to visit the doctor immediately. People with AMS are treated with a number of medicines such Diamox, Nifedipine etc. coupled up with methods like Triple One Test- where one disprin is given with a litre of water along with the rest for an hour. While AMS is most common at the high altitudes yet it can’t be risked taken casually as it leads to severe fatal conditions like HAPE (High Altitude Pulmonary Edema) or HACE (High Altitude Cerebral Edema) which, if not treated on time can lead to a number of serious chronic disorders. These conditions need to not to comply with AMS, they can occur without AMS. It’s suggested to take every single illness into the consideration while you’re on the trek. However, Trekveda is capable of handling all the medical emergencies with its trained professionals yet there are several things that you need to consider, especially the intake of medicines and the knowledge about their advantages and side-effects. Don’t take medicine yourself if you’re trekking through us, always seek help from the trek leaders, they are trained for such purposes, while in case of being a solo trekker, you should know about the medicines. Difficult treks are more adventurous than easy ones. But going on some High-altitude trek like Goechala without calculating its risk is utter stupidity. Safety of our trekkers is on our highest priority list and we do everything to ensure the safe and enjoyable trek. Sometimes Due to some unfavourable conditions, Trekkers have to face some problems. So, here we are talking about some risk involve while trekking and their appropriate response. People always respond as they have learned. Here you will learn to respond on treks while facing unreliable situations. We listed some “What If situation” and their answers best on years on trekking experience we have. On high altitude trek, there is a risk of Acute mountain sicknesses like Nausea, Headache and general discomfort. It will not affect everyone but sometimes the new trekker will face HAPE and HACE, which is a part of AMS. Response: If you feel any of symptoms of AMS or any other discomfort, Inform your trek leader As soon as possible. All the trek leader is trained, they will give you proper measure to ensure your safety on the trek. All the campsite has Oxygen mask, Stretcher and fully equip the first Kid to address the situation like this. Weather is unpredictable in mountains, no one can predict about the weather situation you will face while trekking. So, we always begin trek in favourable trekking conditions. Response: All the trek leaders are mountaineers, they are the best person to decide if it’s safe to trek further or not. The decision of trek leader will final in bad weather condition. Treks are not straight as roads do. Your route will be zigzag or up or down. Small Injuries like bruises or leg Sprain are common but serious injuries like major cuts or fracture is rare. Response: We only work with certified Wilderness as trek leaders. They are trained to handle emergencies and can treat small injuries easily. If any trek member faces serious injuries then they will be taken to the nearest hospital available at that time. We sometimes face network problems in Big cities, Facing the same issue on treks is undustable Still, we do our best to connect you with your loved ones. Response: We use walkie-talkies and sometimes runner to communicate between the campsite and Basecamp. You guardian can send a message on base camp and the base manager will convey your message towards you. And the get a drive to Jaubhari from NJP which is 109 km drive and from Bagdogra its 106 km. Trains Available from Delhi: Dibrugarh Rajdhani Exp, Mahananda Exp, Brahmaputra Mail, Udaipur City Exp etc. There are nonstop flights available from Delhi to Bagdogra. Goechala is moderate type trek which is suitable for beginners if they have at least 2 months physical and mental conditioning. However, even being a moderate type trek, proper study of the trek must be made. Trekking at Goechala, for its ever-lasting memories and experience, demands just a few things which involve physical endurance with physiological wellness. Not just the one who’s physically fit would do the magic in trekking but one also needs to be mentally fit as well in order to cope up with the adversities one might have to face during the treks such natural calamities, rains or other unforeseen conditions. To keep up with such requirements of trekking here are a few things you can do to get yourself physically fit. Getting to the Goechala trek without proper preparation is something you should never do. Cardiovascular exercise is one of the most sought-after methods which provides not just the physical endurance but also the strength to withstand any unavoidable circumstances sternly. Trekking at Goechala demands the high endurance which you can develop in a month or two where you need to begin with the jogging or running (only if you could do). This practice needs to be combined with the speed and distance targets. You need to keep on increasing both with the time. Begin with a target of completing a distance of 5km in 45 minutes and then gradually increase it to 7 km in the same time and remain stick to this practice until you are able to cover 10 km in 80-90 minutes without fail, at a stretch. Another vital area of improvement, you need to work upon. Before you head to the Goechala trek, you need to have the physical strength in order to carry backpacks on the uneven terrains. Considering everything under the sun, you ought to prepare yourself for the core strength. A strength would be making you suffer less than others who don’t prepare before it. Flexibility in the body is what the trekking demands the most. Carrying the backpacks without flexibility can prove out to be fatal. More the muscles relaxed, easier would be your trekking experience. Carrying a backpack, however light in weight can bring you the unnecessary pain which may spoil your entire trek. To pacify yourself or any other companion, yoga and meditation are the keys. These practices not only give you the mental peace but also provide you with a placid inner conscience which is extremely important in order to withstand the cons during the Goechala trek. This also improves your decision-making ability in the stressful situations, during the trek. Try to cover 5 KM in 45 minutes, When you start preparing. Slowly increase your distance to 7 KM at the same time (45 Minutes). After some time you will get the stamina to run longer. Continue this until you can reach 10 KM in 80 -90 Minute, Then stick to Routine till Trek date. If you are older than 45 years and prefer to walk then Jogging. Then Work on completing 10 KM in 90 Minutes. If Jogging in fine for you then try to cover 5 KM in 40 Minutes, gradually increase you Jogging distance in the same duration. Cycling is fine too for increasing stamina. If you are the one who prefers cycling over Jogging then your target should be to cover 22 KM in 60 minutes. All the above said exercises will help you stay in good condition to enjoy the trek. The trek expense of Rs. 15,750 + 5% GST takes care of all expenses of the trek from Yuksom to Yuksom. Backpack offloading charges - If you wish to offload your backpack, there will be an additional charge of Rs. 2500 + 5% GST. The backpack cannot weigh more than 9 kgs. Suitcases/strollers/duffel bags will not be allowed. Please note that charges will vary for last minute offloading in case you decide to offload your bag after reaching the basecamp (Rs. 3200 + 5% GST). Online offloading in advance is possible up to two days prior to the trek start date. Buffer day – It is mandatory to have this extra day as any bad weather or rain will delay your pass crossing. If buffer day is utilized, you will need to pay Rs. 1,850 + 5% GST. This amount is to be handed over to your trek leader. Or if you wish to call off the trek voluntarily at the last moment, in this case the mail requests at cancel@trekveda.com or contact at +91 7078701964 will be entertained. What is the average Goecha la temperature is? 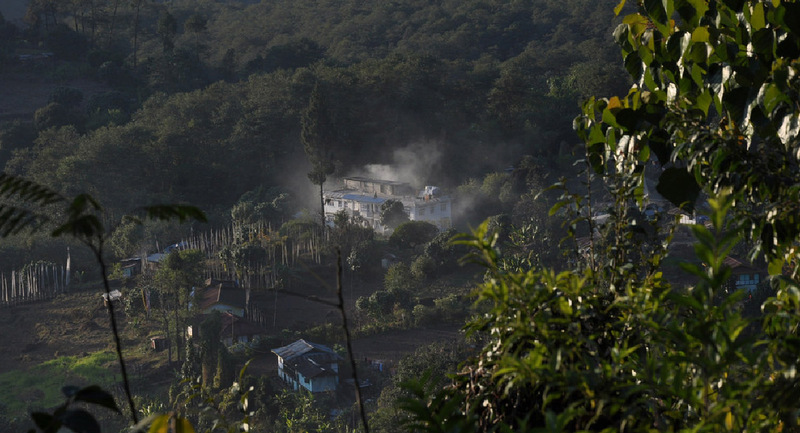 The temperature of Goecha la trek in winter’s remains – 8°C to freezing cold in the night. While on summer the temperature remains from 18 °C to 1 °C. So it’s usually cold there throughout the year. Hence in order to get yourself not bothered with the temperature all you need is to keep yourself tuned up with the changing temperate. However our trek leaders are the trained professionals who would let you know about the precautions, but packing woolen cloth accordingly is your responsibility. How many days Goecha la will take? Goecha la is a pass in Sikkim. Our target is to touch this trek so whole trek is name after pass. Why Goecha la trek is famous? Goecha la famous for its charming forest. While stunning meadows and streams lining the trail will surprise you with its beauty. What is the height of Goecha la Trek? The Goecha la height varies with every phase you pass as your approach the Goecha la trek, you will acclaim a height of around 16,107 ft. Yes, we will provide you the tents and Sleeping bags. Bring Poncho (Rain cover) for your backpack and your own. We will continue on the trail as planned. In the camp sites you will stay under the camps and play games. All the camps are water proof so you will remain dry. What will be the base camp of Goecha la trek? Trekveda makes its basecamp at Yuksom. How do we reach Yuksom? Our basecamp would be at Yuksom. What is the style of accommodation on this trek? Your accommodation at Yuksom in the beginning and the end at the guest houses where you’d be sharing the rooms with the fellow Trekkers. Food and stay cost is included in your trekking package in Guesthouse. The stay on the other days will be in the tents which will be provided by the Trekveda. Each tent will be shared by three fellow trekkers however special arrangements can be made on request. A separate tent will be assigned as the toilet room at each campsite. No, you cannot take your child on Goecha la trek. We provide highly nutritious food during the trek. No, it’s generally not advised to carry your own food during the trek but you can carry nuts and dry fruits if required. When will there be snow on this trek? The best season to see the snow on Goecha la trek is the winter’s where you can see a lot of snow-clad you can also witness the fresh snowfall at heights if the climate is favorable. What are the washroom/toilet facilities like on the trek? There would be a separate tent for the toilet at each campsite. However, there would be no facility to bath during the treks and you need to change the clothes at definite intervals in order to keep up with the hygiene. Maintaining hygiene is extremely necessary during the trek as this may lead to the several fatal problems such as AMS, HAPE and HACE. Trekking pole is one of the key components as well as companion during the trek. It helps you in balancing through the sloppy treks and slippery streams. Carrying a trekking pole may sound irritating but it’s of major use at the high altitudes. No, Alcohol and smoking is strictly prohibited during the trek under any circumstances. Dizziness and other issues may arise due to alcohol, which may attract number of fatal outcomes that would not be good for your health and would affect the trek experience as well. Is there a mobile network on this trek? Mobile network on this trek will be until second day. After that, there is no network coverage. You need to do at least 3 layers. Wearing a warmer along with the jacket would protect you from the cold. Yes, we ensure safety of trekker by providing require medicine and regular health checkup. In addition to this, our trek leaders are the trained professionals which are made to defy all the odds during the trek. How long do we trek every day? The distance of each day would vary as per the campsite location, however, there’s a rough figure of 4-10 Km you need to cover each day during the trek. What is the difficulty level of the trek? Goecha la trek is considered as Moderate to difficult trek. How many Meals in a day? Your basecamp Yuksom will be your starting point and ending point will be the same. You will get this details while booking of every trek respectively. Trekking Shoes, trekking poles, water bottle, sun glasses, poncho, poncho for back packs, Tiffin (Don’t use silver foil). The sloppy ice treks on Goecha la trek make it difficult to walk. You can’t risk taking the preparation for physical strength prior to trek for granted as it may cost you losing your best trek experience. How do I book this trek? You can book this trek via either ways i.e., directly through our websites or you can mail us your queries and dates for the trek. However booking directly through the website will grant you an added advantage of getting all the information about the trek in detail while on mail your knowledge about the trek will be confined to your level of query about the trek. In addition to this, you can also explore other treks of your choice where you’d love to trek later. Do I need special snow shoes on this trek? Yes, Trekking shoes is must for this trek. The trekking shoes give you the needful grip while climbing or crossing the water streams. However on the snow, we would provide you with detachable spikes which will help you to stiffen your grip on the icy slopes during the trek. You need to return these micro spikes attached to your shoes to the trek leaders at the end of the trek at the basecamp or prior to that. Yes, please bring these documents. Via Air trekkers away trekkers will come up with Passport for sure and rest you need to bring 4 passport size photo for official formality on the bases of Nepal government as per the rule. No, But certified trek leader will look after your health. Our trek leaders are professionally trained to fight against any medical complications at the primary level. If you want to offload your backpack, you will have to make a request for offloading a few days before the trek through an email so that arrangement can be made in advance. You will be charged per day for offloading of your backpack. In case you decide to offload on the spot, you may have to pay a higher price than usual. Is there any acclimatization day on this trek? What is the minimum and maximum age limit for this trek? The minimum age limit for this trek is 18 years old. However certain implications are considered by our professionals before accepting the trekkers of age above 50 such as their physical strength and stamina coupled up with any medical condition that may become fatal during the course of trek. Is this a good trek for a first timer? Yes, But you need to be physically fit to trek and have the stamina to trek 4-10 Km a day. No, due to number of unavoidable circumstances we do not arrange any facilities for bathing. It depends on the trek location and your network providers. However, at some treks, it possible to connect to the people while others are left abandoned by the telecom companies. Will Trekveda provide equipment on rent? No, we don’t entertain such facilities. 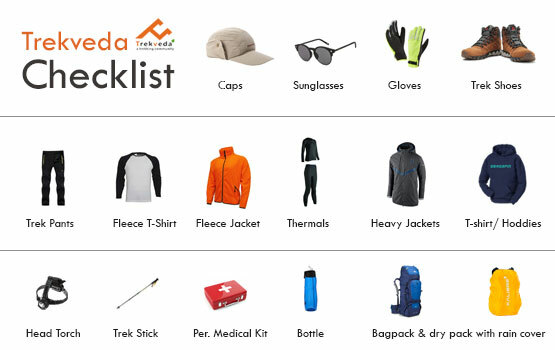 Only the essential gears are provided to the trekkers during the trek by Trekveda, rest they have to purchase all the needful equipment by their own. How do we return after the trek? Returning to the home with the mystical memories would probably be the best feeling after the trek. Your Trek will end at Yuksom in our guest house. Will there be water sources on the way? Is it safe to drink? A tent will be shared among the maximum of three people, however, a number may vary as per demand or the availability of the treks. Yes, keeping the privacy as the priority we keep the accommodation for both genders separated. Special cases may be taken into the consideration. What will be the total expense for a Goechala trek? The total expenses of the trek will be 15,750 INR per person. In addition to that, an addition of 5 percent of the GST will be levied on the total cost.